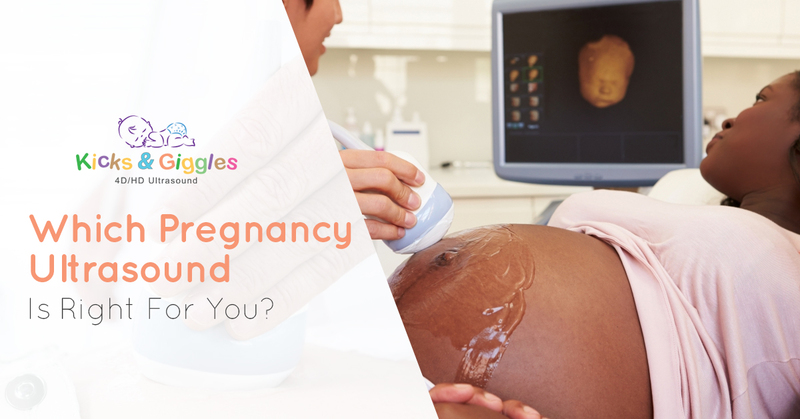 Which Pregnancy Ultrasound Is Right For You? Here are Kicks & Giggles, we offer quite a few package options when it comes to 2D, 3D, and 4D ultrasounds. After all, different mothers come to us with different wants and needs, and we’re more than happy to help them feel closer to their unborn babies. If you’re unfamiliar with the technology and what it can deliver, you might wonder which of the services we offer is right for you. Here are some of the reasons that people choose each particular package. While some people want to keep the gender of their baby a secret until “the big day,” others want to know the gender well beforehand. Even if we didn’t offer the baby gender tests we talk about below, we’d still want to know just so that we can get the nursery in order and make sure we’re getting the right baby clothes at showers! Gender Ultrasound – Our “Gender View package” is very popular for women after the 14th week of pregnancy. At that point, a gender scan is able to be done to determine whether you’re having a boy or a girl. Early Gender Blood Tests – Long before you can find out the gender of your baby from an ultrasound, you can find out with a gender blood test. It just takes a little bit of the mother’s blood to find out if she’s having a boy or a girl! 2D ultrasounds are an excellent means of gender determination of the child. They’re also great for women who are interested in having an “old school” ultrasound, perhaps to compare to their own when they were in-utero. Packages from our 2D ultrasound machine are also our most affordable packages. 3D ultrasounds provide still images of the child in the womb and are able to see a much higher resolution of the baby. Essentially, these are school portraits before the child is even born! 3D ultrasounds are an excellent choice for someone who wants to share still images of their child. When printed out, they make perfect gifts for close friends and family members, especially grandparents. Most parents go ahead and hang them on their own walls as well. 4D ultrasounds are moving 3D ultrasounds. In other words, these are videos that you can share with friends and family either on your phone, your tablet, or on social media. 4D ultrasounds are very popular among tech-savvy individuals who want to show off their baby moving in all of his/her glory! With our 4D packages, you’ll also get some printed images (3D ultrasounds). We can’t tell you which ultrasound package is right for you; you’ll just have to make that decision on your own! No matter which you choose, we look forward to seeing you in here at our Orem, Utah office and letting us share this exciting time with you.